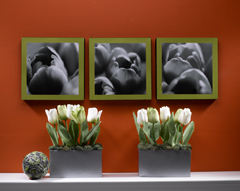 Using three photos, scrapbook paper and ribbon you can make yourself this black and white tulip wall art in four easy steps. You can also create these photos in different sizes. Ribbon, 1" x 4-1/8 yds. If using 12" x 12" x 1" squares, skip to Step #2. Using ruler and pencil, score foam sheet to create three, 12" x 12" squares. Wax serrated knife with an old candle. Holding foam sheet firmly on a flat surface, extend one end and cut across the score line, using knife like a saw. Or, try dental floss: Stand the sheet on its edge and hold a 20" length of dental floss along the scored line, positioning one hand at the bottom of the board and the other at the top; draw the dental floss down through the foam sheet along the scored line. Spread white craft glue on foam square; center and glue scrapbook paper to foam square. The scrapbook paper "frames" the photo and serves as the photo matt. Spread glue on reverse side of photo; center and adhere to scrapbook paper. Repeat for two remaining photos. Optional: Place a heavy book on top to hold down photo while glue dries. Pin or glue ribbon around edges. Hang pictures with poster putty. Or, glue sawtooth picture hanger to back. For additional hold, insert and glue two straight pins through holes in sawtooth picture hanger. Let dry before hanging. Note: Instructions are for three, 10" x 10" photos; however, you can easily use the techniques below to create wall art for photos of different sizes. Your local office supply store or an online photo developer can print the photos for you.